Our personal process will be documented by photos and individual sketch diaries. 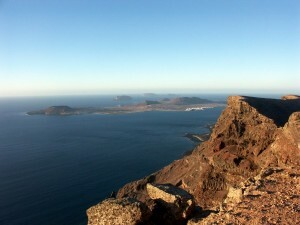 From the north of Lanzarote, you have a fantastic round view to the island La Graciosa. Above here you will perceive why this name means „The Charming“. Picturesque this beauty is at our feet with its lonely beaches, clear water, four rolling hills and two quaint villages. 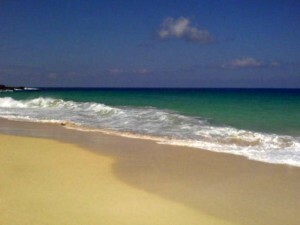 This unparalleled landscape, without big tourist crowd, offers pleasant retreats for contemplation and self-perception. Streets are not asphalted and there are only a few Jeeps driving us across the island, as needed. The capital-village of La Graciosa is called Caleta del Sebo. 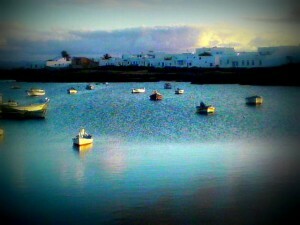 The ferry from Lanzarote arrives here in the little harbour and brings the guests, the commuters and daily demands. This hamlet is inhabited year-round. The about 700 residents are living from fishing and the few guests who are kindly welcomed by bright white houses with blue or green painted doors and window frames. La Graciosa has an agreeable climate. The temperature in summer rarely rises up to 30 degrees and in wintertime it's very comfortable with 15 degrees during the nights. Since 1995 La Graciosa has formed part of the Chinijo Archipelago Marine Reserve which, with the surface area of 70,000 hectares, is the largest marine reserve in Europe and contains many valuable species. Also the island has formed part of the Natural Park of the islets to the north of Lanzarote since 1986. This natural park was also declared to be a special bird protection zone by the EU. This guards the isle against further touristic expansion and keeps the ease and charm. There are no sources at all in Graciosa, therefore the unhabitated island was a favourite pirate hide-out between 16. and 19. century. Today drinking water is brought there via pipeline from Lanzarote and with tankers. It seems like time is standing still, nevertheless La Graciosa is perfect for outdoor activities such as walking, diving or taking fotos. Nearly all trails are quite flat, so it´s easy to get around on a bike.